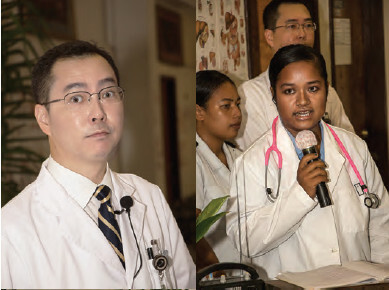 Pohnpei, FSM—Three students of the New Tokyo Medical College will be going on to their fifth and sixth year clinical training. This afternoon, the College staged a “White Coat Ceremony” for the three successful students. They are the first students of the New Tokyo Medical College, the only medical college in the northwest Pacific, to reach this stage in their medical training. 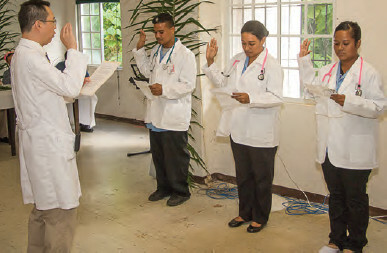 Kevin Saumar of Yap, and Crystal Sopepa and Taneleen Damarlane of Pohnpei made the cut and will be going on to the Guam Regional Medical Center for four weeks of introductory clinical observation. Afterward they will move on to Cebu Doctor’s University Hospital in the Philippines. Wehns Billen, a member of the board of trustees was present at the ceremony as were, Governor Marcelo Peterson and, Senators Shelton Neth and Sendelina Lekka. Mrs. Nanpei was present as was Kolonia Town Mayor Jose San Nicolas. Two representatives from the Embassy of the People’s Republic of China were also present for the ceremony. Since the students are scholarship students, New Tokyo Medical College is responsible for all tuition and living expenses. Dr. Hong wrote that the White Coat Ceremony (WCC) originated in University of Chicago’s Pritzker School of Medicine in 1989, but the first full-fledged ceremony was at the Columbia University College of Physicians and Surgeons. In 1993, Dr. Arnold P. Gold, a teacher and pediatric neurologist, created the first full-fledged WCC at Columbia University College of Physicians and Surgeons. Before this ceremony, medical students typically received the Hippocratic Oath for the first time at commencement. This ceremony marks a change in tradition, introducing students to the Oath before starting their first year of study. This was intended to provide students with well-defined guidelines regarding the expectations and responsibilities appropriate for the medical profession prior to their first day of class. Since its conception at Columbia, the WCC has spread rapidly to schools of medicine, dentistry, osteopathic medicine, and nursing worldwide. New Tokyo Medical College, also known as NTMC, is a professional medical school located in Kolonia, Pohnpei, Micronesia. It is the first fully-approved medical school established in the Northern Pacific Ocean Area to cultivate medical professionals. It was founded as a non-profit education foundation with its vision to contribute in nurturing of medical professionals needed for the Federated States of Micronesia and its neighboring Pacific Islands. NTMC hasd obtained the approval for its establishment from the State Government of Chuuk on June, 2009. It also hasd received official approval from the National Government of the Federated States of Micronesia for establishment of non-profit foundation in May 2011, and was formally established as a 6-year medical college. The school is recognized by the Foundation for Advancement of International Education and Research (FAIMER) and the Educational Commission for Foreign Medical Graduates (ECFMG), and listed on the International Medical Education Directory (IMED). In addition, NTMC is listed on the World Directory of Medical Schools under the directives of World Health Organization (WHO). NTMC offers many open and innovative education curriculums in order to cultivate medical professionals who are equipped to be competitive in the dramatically changing 21st Century and who possess strong ethics and a sense of duty. It also thrives to promote an intellectual environment that can achieve wider innovation and advancement in the medical and health fields through various collaborative efforts with many reputable education institutions in Asia and the United States. NTMC currently offers both 6-year and 4-year MD programs for highly qualified students from the local area as well as from other parts of Asia. The faculty members of NTMC are composed of dedicated professionals and educators from United States, Philippines and Korea. The current total number of students enrolled in NTMC’s program is 60. The first cohort, all of which are excellent local students from Micronesia, will graduate from NTMC in 2018, and they will begin serving the underserved area upon completing their residency training as early as 2020. 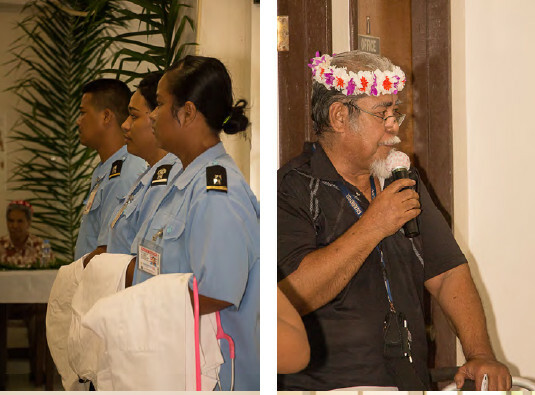 NTMC will continue to make significant contribution to the local community and maintain its founding motto by cultivating and supplying much needed well-trained local doctors for the area of Micronesia and its neighboring Pacific Islands on a steady basis. At the same time, it will also continue to enhance and improve the quality level of its medical training and education through establishment of collaborative relationships with local hospitals and institutions including Pohnpei State Hospital. Dr. Hong, the founder of New Tokyo Medical College is a former AMEDD (Army Medical Department) officer,. Dr. H. Christian Hong was nominated by the Board of Regents oin May 2012 to serve as president of New Tokyo Medical College. His nomination was confirmed by the Board of Regents the same month and he was sworn in as the first president of New Tokyo Medical College. Prior to his New Tokyo Medical College appointment, Dr. H. Christian Hong served as Chief of Immunology, Brooke Army Medical Center (BAMC), San Antonio, Texas. Other assignments include Principal Investigator (as a Captain) at Department of Radiation Medicine, Armed Forces Radiobiology Research Institute, Uniformed Services University, Bethesda, Maryland, and Captain, Walter Reed Army Institute of Research, Walter Reed Army Medical Center, Washington, District of Columbia. Dr. Hong holds Diploma from U.S. Army Academy of Health Sciences; graduate and doctorate degree from New York Medical College, New York and Nova Southeastern University, Florida respectively. Additionally, he holds a professional degree in medicine. He was awarded a Meritorious Service Medal, Joint Service Commendation Medal, Army Commendation Medal, and Army Achievement Medal.